Joan Brehm, co-director of the Center for a Sustainable Water Future at Illinois State University spoke with campus and community members at a forum on local and global water issues. Illinois State University is pulling in local partners to explore worldwide challenges to water. The University recently established a Center for Sustainable Water Future, which will encourage long-term water solutions through academic research, and teaching, creative, and learning opportunities from across campus disciplines. “Water is a crucial global resource, and water insecurity—or the absence of clean drinking water—has profound implications,” said Professor of Sociology Joan Brehm, who will co-direct the center. Harriet Steinbach of the Center for Community Engagement and Service Learning takes part in a forum with community members to discuss water issues. 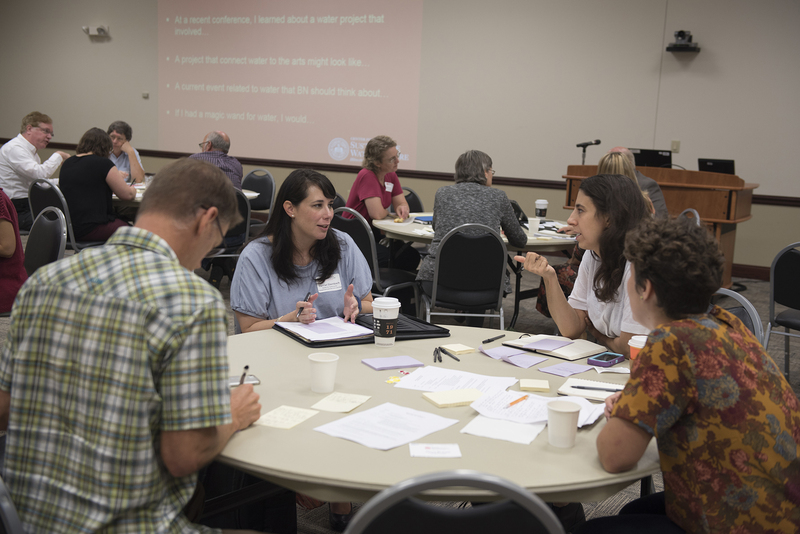 In September, Brehm and co-director Professor of Politics and Government Noha Shawki invited local organizations that work with water-relevant issues to campus with the aim of building community partnerships. “The first step was really for us to listen, to hear the needs of community organizations, and understand the opportunities we have to work together,” said Shawki, who added that the center will explore everything from student internships to research projects in ways to assist organizations. The center will be housed under the Office of the Provost. More information on the developing center can be found at the website, or email watercenter@illinoisstate.edu.